" 20 people are participating here. We give socialization over request of them"
Residents living in RT 09/06, Jalan Rawa Bambu No. 11, Pasar Minggu Urban Village, Pasar Minggu, South Jakarta are given socialization about the dangers of fire due to leaking gas. "20 people are participating here. We give socialization over request of them," expressed Andrian Novandi, Group B Peleton Commander of Pasar Minggu Sector IX, South Jakarta Fire and Rescue Sub-dept., Monday (9/10). 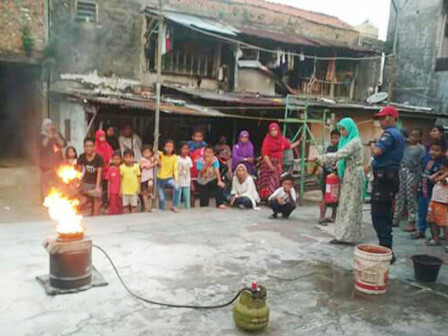 In the socialization, his side taught how to extinguish fires in a modern way, using portable fire extinguisher (APAR) or manually using sacks wet, and wet towels. "We do this to make them understand well how to extinguish the fire. So they can handle fire early before spreading to other homes," he said.